LIVING PLANET REPORT 2016 The future of the planet is in our hands. WWF’s Living Planet Report 2016 shows the scale of the challenge – and what we can do about it. The future of the planet is in our hands. WWF’s Living Planet Report 2016 shows the scale of the challenge – and what we can do about it. The evidence has never been stronger and our understanding never been clearer. Not only are we able to track the exponential increase in human pressure and the consequent degradation of natural systems, but we also now better understand the interdependencies of Earth’s life support systems and their limits. The future of the planet is in our hands. 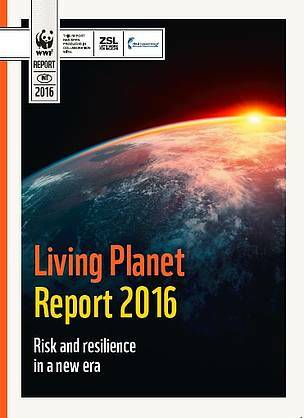 WWF’s Living Planet Report 2016 shows the scale of the challenge – and what we can do about it. 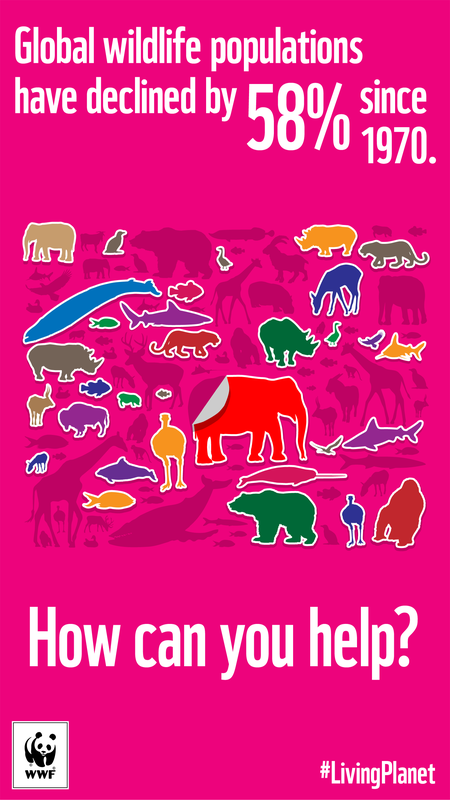 Global biodiversity is declining at an alarming rate, putting the survival of other species and our own future at risk. The latest edition of WWF’s Living Planet Report brings home the enormity of the situation - and how we can start to put it right. 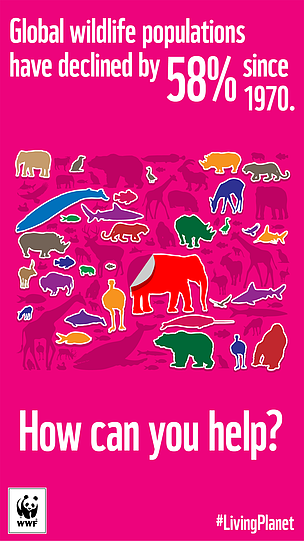 The Living Planet Index reveals that global populations of fish, birds, mammals, amphibians and reptiles declined by 58 per cent between 1970 and 2012. We could witness a two-thirds decline in the half-century from 1970 to 2020 – unless we act now to reform our food and energy systems and meet global commitments on addressing climate change, protecting biodiversity and supporting sustainable development. Too busy to read the full report? Human activities are pushing our planet into uncharted territory. In fact, there’s strong evidence that we’ve entered a new geological epoch shaped by human actions: “the Anthropocene”. The planet’s inhabitants – Homo sapiens included – face an uncertain future. The loss of biodiversity is just one of the warning signs of a planet in peril. The Ecological Footprint – which measures our use of goods and services generated by nature – indicates that we’re consuming as if we had 1.6 Earths at our disposal. In addition, research suggests that we’ve already crossed four of nine “Planetary Boundaries” – safe thresholds for critical Earth system processes that maintain life on the planet. But if humans can change the planet so profoundly, then it’s also in our power to put things right. That will require new ways of thinking, smarter methods of producing, wiser consumption and new systems of finance and governance. The Living Planet Report provides possible solutions – including the fundamental changes required in the global food, energy and finance systems to meet the needs of current and future generations. We have only one planet. It’s up to us to look after it. Click here to see Marco Lambertini, Director General, WWF International, discussing the key findings of the 2016 Living Planet Report.